Previously there were just a few innovations in the sphere of mini-PC. There are some examples that are worth to be mentioned here. They are ASUS ROG GR6 and ASUS ROG GR8, or stylish designed mini-PC, such as ZOTAC ZBOX Sphere. What are the main features that can be found in every mini-PC? Most systems are oriented on 2.5-inch storing device, small amount of operational memory and SSD M.2. All of these features can be seen in pint size and simple equipment rack. As a rule Intel Atom or Celeron processors are found there. Acer Revo One RL85 became a breath of fresh air. Speaking about its design, this mini-PC should not be embarrassed by Apple products. And, speaking its inner part of the device, three 2.5-inch HDs can be put in there. 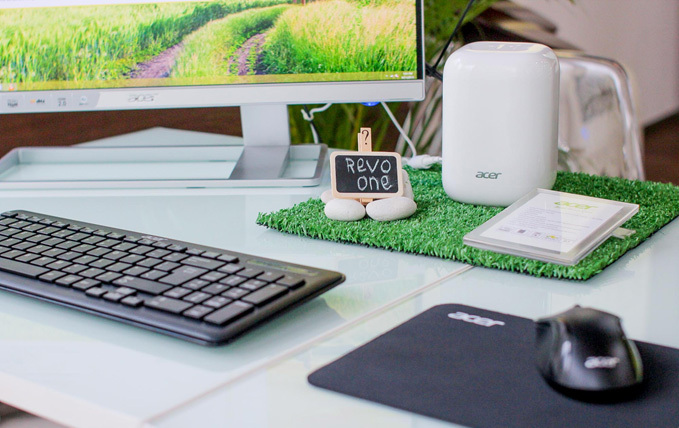 In case you have decided to buy new mini-PC, there is a great number of products that can be found at the technology market, but there are a few outstanding ideas that are to be chosen. Technologically there are not many differences between various mini-PCs. As a rule, manufacturers use Intel Atom or Celeron processors, as it was mentioned before, or they put in their devices a little bit quicker mobile CPU combined with digital graphics card. Storage space is about 4GB, SSD or HDD in 2.5-inch format is used as a storing device. Interfaces are provided with USB 3.0 port, HDMI and slot for memory cards. But this new Acer Revo One RL85-UR45 is groundbreaking notable for its features. 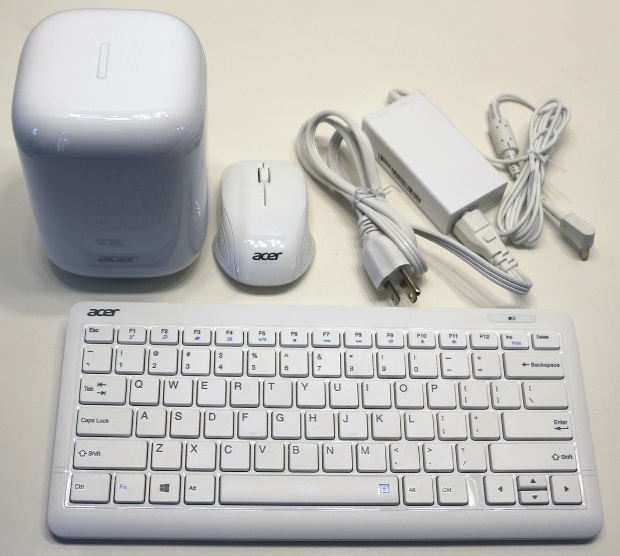 Besides, it is at the too of the whole Acer mini-PCs that are presented nowadays. Mini-PC is oriented on “tailor-made” design that is rather similar to Apple Mac Pro that was presented in 2013. It will look good at the working table and in a sitting room by the TV-set. 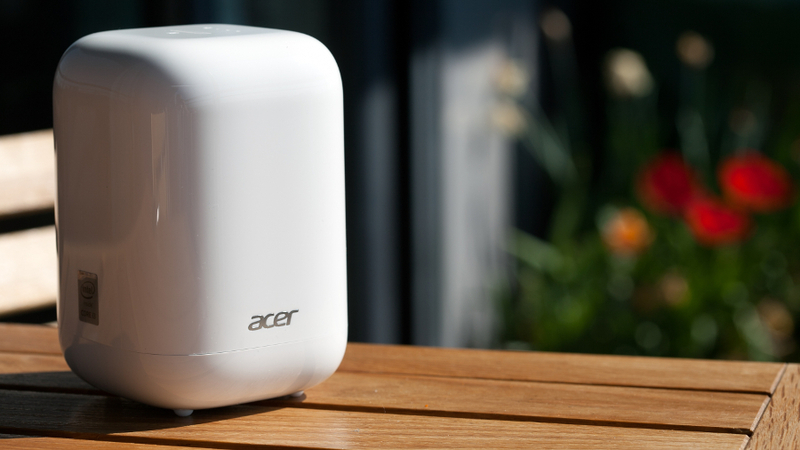 Acer has chosen cylindrical body with white “patent finish”. Acer Revo One RL85-UR45 has Intel 2.2 GHz Core i5-5200U processor with two cores together with 5500 HD graphics. Also it obtains 1 TB hybrid drive and 8 GB DDR3L of random access memory. Working in the Internet is provided by Azureware AW-CB161H 802.11ac and wireless card that is available thanks to Bluetooth 4.0. Windows 8.1 is also one of the notable features of presented device. There are some ports and slots in Acer Revo One RL85-UR45. They are USB 3.0 (two), USB 2.0 (two), mini DisplayPort, gigabit Ethernet and lock port by Kensington. Also there is SD card reader slot that is presented on the top of the mini-PC. Acer Revo One RL85-UR45 is sold in different configurations. The cheapest version has Intel’s processor, i.e. Celeron 2957U, and 4 GB RAM. The variant with Core i3 processor is situated a little bit higher. It also has double amount of memory (when requested). According to the model Acer puts 500 GB for hard disk drive (HDD) or 128 GB for solid state disk (SSD). But there is also a variant that is equipped with 1 TB HDD and additional 2 TB HDD. Taiwanese manufacturer can install hybrid SSHD that is the combination of flesh-memory and magnetic storage. Top model is based on Intel Core i5-5200U with 8 GB DDR3L. Albeit its age, we can confirm that Acer Revo One RL85-UR45 is the nice device that can comply with different tasks at the same time. 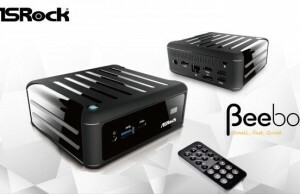 Speaking about given device and its comparison with other mini-PCs that have been already presented in the technology world it obtains slower processor than Intel NUC5i7RYH as the last mentioned device has Core i5-5557U Broadwell-U processor that is rather fast in comparison with Acer Revo One RL85-UR45. Furthermore, Intel’s device costs even less! Also Acer Revo One RL85-UR45 is not faster than Brix GB-BXA8-5557 manufactured by Gigabyte that is also cheaper than our device. 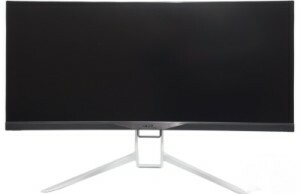 So what is the benefit of Acer Revo One RL85-UR45? What do we have with this device? And the answer is that we have the significant opportunity to work in absolute quietness. Any noises can distract us with our RL85-UR45. Also it has less power consumption. To sum up, Acer Revo One RL85-UR45 combines in itself such features as small footprint, quietness and minimal power consumption. The user have an opportunity to enjoy all of these mentioned above things and choose the variant of the mini-PC according to his/her desires and wishes (from the cheapest to the most expensive one). It is small, well-designed mini-PC that is now presented in the computerized world. It presents the whole world of adventures just in one small device that be taken in every journey and business trip; or you can put it even in a small room. Its quality of sound and graphics impress. Besides, Acer Revo One RK85-UR45 gives an opportunity to use your smart phone as a navigation console for your mini-PC. Mini RL85-UR45 is a compact device that obtains unbelievable storage volume and capacity.